The camp at Karadong, November 2011. Photo 1235/1(823). Photographer: John Falconer. Karadong was visited by Stein on his first expedition, following the accounts by Sven Hedin of his visit in 1896 and those of Stein’s guide, Turdi, ‘whose “treasure-seeking” expeditions had twice extended to this place’. 1 It took Stein six days travelling on long marches, stopping en route to hire labourers. We covered his first five days’ in one, by 4WD vehicles for the 200 km drive up the course of the Keriya River to the village of Daheyan or Darya Bayi, visible from a distance thanks to its newly erected China Mobile transmission tower. Although the river has reduced considerably at Daheyan it was still not possible to ford and we crossed by a footbridge, making our way to the house of Matsaydi Abla, guardian of the Keriya sites. Stein noted here that he could make out three dry river beds spreading out in different directions ‘like the fingers of a hand’ 2 but he saw little on his march owing to the wind. The next day we slowed down to Stein’s pace: the fifteen camels hired for the trek to Karadong were loaded and we set out up the branches of the now dry river bed, passing farmsteads and herds of sheep and goats. At one we were warned of wolves but we only saw deer and a remarkably fearless hare. Like Stein, we set out west across the lifeless dunes for the final few kilometres and set up camp near the ruin Stein called K.I. 2. 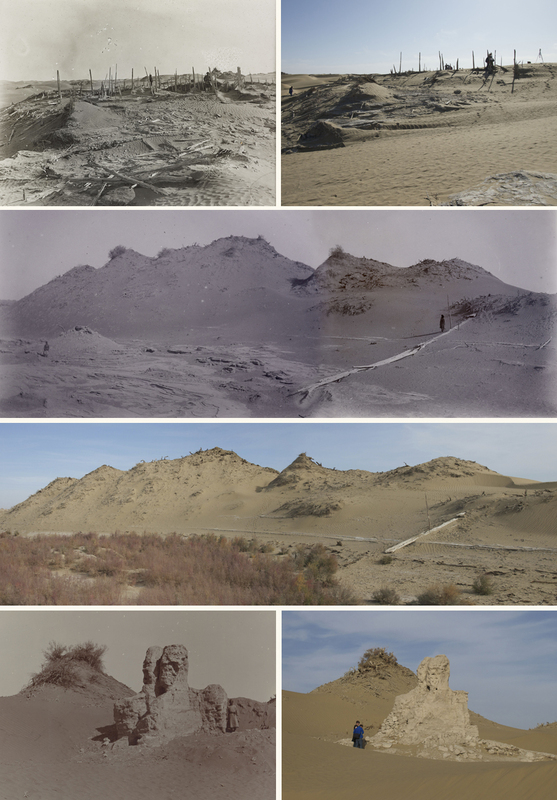 M. Aurel Stein, Sand-Buried Ruins of Ancient Khotan , London 1903: 426-7. The team at Kaysar Mahmut’s guesthouse, Kapak-astan, on the way to Niya, November 2011. Photo 1235/1(108). Photographer: John Falconer. Kaysar Mahmut and his wife and son, Hu Xingjun, Matkasim Tomur, driver, Anwar Abulkasim, Nijat Rozi, Susan Whitfield, Alastair Morrison, Idris Abdurusul, driver, Vic Swift, Rachel Roberts, John Falconer (l. to r.). 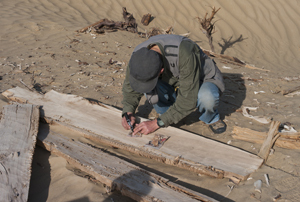 In 2008, as part of the IDP collaboration, Xinjiang Autonomous Archaeological Institute, with the approval of the Cultural Relics Bureau of the People’s Republic of China and the cooperation of the British Library, started in-situ investigations of the ancient ruins of the Southern Taklamakan, including Endere, Rawak and Miran. In order to enable the smooth continuation of this project, and given the extensive documentation by Stein on ruins of the Southern Taklamakan, the Sino-British team continued their in-situ investigations at Niya and Karadong from 7th to 23rd November, 2011. By referring to Stein’s photographs and other documentation from over a century ago, the team was able to see that, although the whole site was fundamentally preserved, the effects of the environment were evident – especially erosion caused by the wind and sand. The ruins of Niya are situated in Niya Township, Minfeng County, Khotan Prefecture, Xinjiang on an old delta of the Niya River, deep in the Taklamakan Desert. The site was mapped by Stein during four visits in the last century. Between 1991–97, the Sino-Japanese Niya Investigative Team set the northern and eastern limits to 37° 58’ 45.3” and 82° 43’ 13.5”, with the stupa at its centre. The various remains are distributed in groups throughout the ancient river delta zone, extending 30 km from north to south and about 5 km from east to west. The southern border is over 100 km from the present-day town of Minfeng and 28 km from the oasis at the end of the Niya River today. The site was originally discovered in 1901, over a century ago. Since then archaeologists have discovered a great number of documents in Gāndhārī-Prakrit written in the Kharoṣṭhī script as well as some in Chinese. Other finds include money, silk, artefacts and finely carved furniture and building structures. The archaeological investigations have revealed over a hundred remains including houses of different sizes, a Buddhist temple, a stupa, cultivated areas, orchards, roads, handicraft areas, graveyards, irrigation systems, and walls. These were given identifiers with the form N.I., N.II. etc by Stein, and 95NMIgraveyard, by the Sino-Japanese team. Photographs by Stein taken between 1901 and 1916 and Vic Swift of IDP taken in 2011. Top: Niya site N.I., The British Library, Photo 392/34(165) and Photo 1235/3(138). Middle: Panoramas of ancient bridge at Niya, The British Library, Photo 392/28(306 & 307) and Photo 1235/3(157). Bottom: Niya Stupa. Library of the Hungarian Academy of Science, Stein Photo 5/2(67) and Photo 1235/3(41). The Niya ruins comprise the largest extant settlement on the southern Silk Road in the Taklamakan. But apart from the excavated ruins, there are many still covered by the sand and yet to be exposed and excavated. They will yield important resources for the study of oasis settlements. At the same time, because Niya was on a major hub of the Southern Silk Road and thus a place for cultural exchanges from east and west, the excavated documents make clear that this was a place of interactions between Chinese, Indian, Graeco-Roman and early Persian cultures. The good condition of the ruins, their rich cultural connotations, and their extent make them rare worldwide. 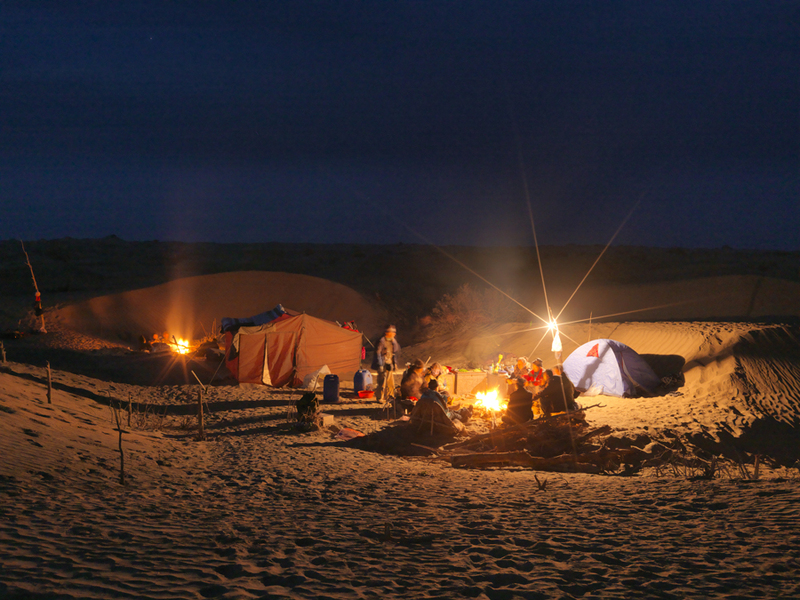 Research on human culture in barren oasis settlements and their relationship to changes in the environmental circumstances, and on east-west cultural interactions on the history of Central Asian culture, have been greatly enhanced as a result of the investigations at Niya. The work of the 2011 team in carrying out in-situ verification of the changes over the past century, supplementing and improving the existing records, and obtaining rare first-hand data, will prove an important resource for the study and protection of the ancient Silk Road. 1. See article by Rachel Roberts on House-building in Ancient Niya. In November 2011, a team from IDP and the Xinjiang Institute of Archaeology (XJIA) visited the archaeological site of Niya, an ancient settlement deep in the Taklamakan desert only accessible by specialist sand vehicles. In the first to third centuries Niya was a flourishing oasis kingdom of farmsteads extending up the Niya River, producing grain, wine and fruits such as apricots, plums and pomegranates. The team spent several days documenting the extensive remains; the site is over 30 km long and 5 km wide and contains over one hundred separate sites, some discovered by Marc Aurel Stein in the early part of the twentieth century and more by a Sino-Japanese team throughout the 1990s. Apart from one clay brick-built stupa all the sites we examined consisted of the remains of buildings with a wooden structure and many features in common. 11. Roof bracket from Niya, The British Museum 1907,1111.96. All photographs by Rachel Roberts. Apart from one clay brick-built stupa all the sites we examined consisted of the remains of buildings with a wooden structure and many features in common. The materials used to build at Niya were inevitably dictated by the environment, a desert region with limited water and no nearby sources of stone. The main material used for the structure of the building was timber from poplar trees. The poplar tree grows fast and to a good height. It has a deep invasive root system so can tolerate periods of drought and flourishes in clay and sandy soil. A wild black poplar (populus nigra, known locally as toghrak) still grows plentifully in this region in settled areas and forests of dead toghrak from the Niya-period can still be seen to this day (Fig. 1). The trunk and branches of the toghrak are twisted and knotty and far from ideal for building work. Stein observed that at Karadong, the second site visited during the field trip, the structures of the ruined quadrangle all seemed to be constructed from toghrak and he concluded that a more suitable species was not cultivated here. However, at Niya the dwellings were mostly constructed using the cultivated white poplar (populas alba, known as terek). Fallen white poplar were observed to the southeast of site N.V. up to 10 m long with a diameter of 50 cm. 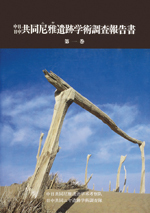 This type of tree, being fast-growing, tall and strong, is still widely used today in the Taklamakan and Gobi oases. It is especially effective as a wind break for cultivated fields and can be seen being used to protect cotton fields around Dunhuang. The best quality terek were used for the base or foundations of the house. More usual techniques were not suitable for the sandy ground which is very prone to shifting and erosion. As Stein observed: ‘Massive squared beams of White Poplar or terek wood, usually extended below several rooms, and in some instances exceeding 40 ft in length, formed a kind of foundation; their thickness, which varied from 6 to 10 inches according to the size and importance of the walls they supported.’ ( Ancient Khotan , p.317). The size and weight of the timbers increased the contact area between the foundations and the ground making the building more stable. The huge foundation beams can be seen at site N.II. protruding into the air due to erosion (Fig. 2). The corners of the foundation beams were joined together using a double-notched joint (Fig. 3). The Niya house builders seem to have only used a partial notch on the underside beam although it is possible the end section of the beam has been lost due to the erosion of the wood. Double-notched joints are commonly used in structures made with large timbers. The double notch prevents movement in either direction and also allows adjustment to maintain a uniform line when timbers are not all exactly the same size. This would have served the house builders of Niya well as although the foundation beams are very skillfully cut — something that was frequently noted by Stein and his workmen during excavations — they did not have mechanical cutting equipment to produce uniform materials. The corner uprights that form the walls serve two purposes: they create the skeleton wall structure but also further strengthen the corner joints of the foundations. A mortise and tenon joint is used to secure these uprights. Mortise and tenon joints are still commonly used in frame construction today as they are versatile, easily concealed and efficient at holding a frame together. There are many different types of this joint; the type used for the construction of the wall uprights is a through mortise and tenon, where the mortise hole goes completely through the timber member. The uprights strengthen the foundations by the mortise hole being cut through the top of the double notch joint and when the tenon is passed through the mortise it serves as a locking pin for the joint below (Fig. 4). To complete the structure of the wall smaller intermediary uprights about 7 cm square were placed at distances of about 30 cm apart (Fig. 5). The corner uprights and the smaller intermediary uprights were joined along the top by heavy beams similar in size to the foundation beams. The sites at which the top beams had survived were few although good examples of this were seen at N.VIII. and N.XII. (Fig. 5). The corner uprights were fixed to the top beam in the same way as they were fixed at the bottom to the foundation beams, forming a box shape. The intermediary uprights were also fixed with a mortise and tenon joint but, as these posts were not as large as the corner uprights, a stub mortise and tenon was used, which is where the mortise hole is only cut part of the way into the timber. If a through mortise and tenon had been used here the large foundation and top beams would have been weakened by the mortise holes. Two methods of strengthening the wall structure were observed. 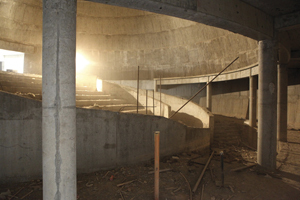 The first was to incorporate a horizontal beam running between the two corner uprights (Fig. 5). This increased the stability of the wall and shortened the lengths of the intermediary uprights thus reducing the amount of movement over time, which would have affected the integrity of the wall. This horizontal beam was fixed into a groove running the length of the corner upright and supported by the intermediary uprights that were stub mortised and tenoned into its underside. The second method, seen at N.III., is a diagonal member inserted into the groove in the corner upright and stub mortised and tenoned in the foundation beam (Fig. 6). Short intermediary uprights have been added to allow the fixing of the wall covering. The wall covering was made using two different methods, firstly a system of thin tamarisk branches woven into diagonal matting (Fig. 7). Stein felt that the diagonal matting supplied a stronger core to the walls than the second method, which was the use of reeds laid in horizontal layers (Fig. 8). The reeds or diagonal matting were tied onto the uprights with twine. Both methods were seen in the sites of Niya although the diagonal matting is more common with reeds being employed in some of the earlier ruins, N.III., N.IV. and N.V. Stein also observed while excavating N.III. that diagonal matting was used up to a height of 6 ft (c.2 m) with reeds used above this. Once in place the core of the wall was covered with what Stein described as a ‘hard white plaster’ making the wall structure about 7 in (12 cm) thick (Fig. 9). Very few of these ancient dwellings have surviving roofs. When Stein was excavating he found a few, including one on the gate house at the Karadong quadrangle. This has subsequently been lost — evidence of a fire was visible during our visit. But much can be learned by studying the modern-day houses in settlements local to the desert sites. Examples of construction methods identical to the ancient dwellings in Niya can be observed in Kapak-astan and Daheyan. In Daheyan, a village about 25 km to the southeast of Karadong, there was an opportunity to study the roof structure in the house of Matsaydi Abla. The roof consisted of a series of large beams about 15 cm square that were positioned about 40 cm apart centre line to centre line (Fig. 10). The ends of these beams were secured into the beam that formed the top of the wall. The beams were visible from the exterior protruding from the wall by about 40 cm. The joint seemed to be a double-notched joint as seen in the foundations at Niya. Inside the house there were two large beams of a similar size running at 90 degrees to the roof beams. These offered further support to the roof and so allowed a larger room size. These two support beams were in turn supported by a pillar at their centre point which had a carved wooden bracket where the beam and pillar joined: this bracket resembled many excavated from Niya (Fig. 11). The roof covering was reed matting woven in the same way as the tamarisk matting seen in the walls of the Niya dwellings. This matting was supported between the roof beams by a series of roughly cut noggins about 10 cm apart. A layer of plaster had been applied on top of the matting. This completes the basic construction of the Niya dwellings. Windows were added but they were very small due to the need to keep the houses cool during the very hot summer and warm during the freezing winter. Buildings increased in complexity with their importance: many had intricate carvings and complex room layouts demonstrating further the advanced carpentry skills of the contemporary builders, skills that are still used to the present day. Rachel Roberts is Studio Manager and Photographer at IDP. She led the video team at Niya. She is also a professional carpenter. Idris Abdurusul bagging up the few scattered textile remains at a looted grave site at Niya, November 2011. Over the past three decades there have been systematic archaeological excavations of sites belonging to the ancient kingdoms of Khotan in the western Taklamakan and Kroraina in the eastern Taklamakan and Lop Desert, both in modern-day western China. These have been carried out by Chinese archaeologists, some in conjunction with Japanese and French teams. The exploration of these kingdoms, however, began much earlier. Early in the twentieth century Sven Hedin and Aurel Stein uncovered significant archaeological remains and archives and brought the importance of these cultures to the attention of an international scholarly public. The materials they excavated are now in various collections in Europe and worldwide, and their influence on modern understanding of Central Asian history and society is without parallel. The planned event has already attracted widespread international attention. Leading researchers have accepted invitations to the conference. This includes members of the Chinese, Japanese and French excavation teams, and scholars from the USA (Yale, Harvard, Berkeley, St Louis), Europe (Stockholm, Munich, London, Nottingham), China and Japan. The conference further plans to provide a platform for young scholars and PhD students who will be offered the opportunity to present their research in poster format. Finally it will introduce several digitisation projects that are making the materials and archives accessible to an international audience. Ample opportunity for discussion will be provided to explore options of future work and collaboration. There is a registration fee of GB£40 (£20 for students/OAPs) which will also cover refreshments over the two days. To register or for further details see the conference web page. Academician Sergey Fedorovich Oldenburg (1863–1934) is one of the most significant figures in the history of the RAS in the first part of the twentieth century. From 1904 to 1929, he served as Permanent Secretary, RAS, and in many respects it was thanks to his efforts that the RAS retained its position in the Soviet state. From 1916 to 1934 he was a Director of the Asiatic Museum, which in 1930 was reorganized into the Institute of Oriental Studies of the Academy of Sciences. The Russian Turkestan Expeditions of 1909–10 to Turfan and of 1914–15 to Dunhuang, both headed by Oldenburg, played a significant role in the investigation of the cultural heritage of northwestern China. In 1915, the Second Russian Turkestan Expedition brought to St. Petersburg books and manuscripts from Cave 17 at Dunhuang, as well as objects of Buddhist art. This international conference is in commemoration of his 150th anniversary. For details contact: iom@orientalstudies.ru, popova@mail.convey.ru. Above: Recto of OA 102-MS-2a-l. The Danish telegraph company, Det Store Nordiske Telegraf-Selskab,1 operated in China from 1870 until the Japanese invasion in 1937. Many of the Danish employees working in China became interested in the local culture and collected ethnographic material, handicrafts, art and manuscripts. A number of these objects subsequently became part of the ethnographic collections of the Danish National Museum, whereas the manuscripts were often donated to The Royal Library. Arthur Bollerup Sørensen (1880-1932) was one of the company’s telegraph controllers working in China from 1901 to 1931. Like many others, he became fascinated by the country and wanted to understand it better. Unlike others, he did not confine himself to collecting but instead set out to explore some of the more distant regions of the vast country. He undertook three separate expeditions to north and northwestern China. He was himself responsible for funding the expeditions but his employer supported his endeavours by giving him time off at full pay for the months he spent away. On two expeditions — 1915 and 1921–22 — Sørensen’s goal was to reach Lhasa but on both occasions he was thwarted by the social and political unrest both in Tibet and in the bordering areas. During the 1921–22 expedition, he managed to reach an area located about 200 km northwest of Lhasa but was unable to continue further. Sørensen made careful notes and during the 1921-22 expedition he also drew detailed maps of the routes and areas visited. It was not until almost twenty years after his death that his notes, diaries and some photographs were published as a monograph with the title Ad Asiens ukendte veje (Gyldendal: Copenhagen 1951). During the 1915 expedition, Sørensen visited Dunhuang and met with a monk who offered to sell him a small number of manuscript scrolls. This was probably Wang Yuanlu. Sørensen bought fourteen scrolls. Because he was not interested in Chinese manuscripts, he donated them to The Royal Library in Copenhagen on 29th November, 1915. Dunhuang scholars have recognized the authenticity of all the sixteen texts. In 2000, their paper was analysed by Anna-Grethe Rischel, at that time Head of the Department of Conservation in the Danish National Museum. The analysis concluded that the paper was similar to that on the documents in the Hedin Collection in the Swedish Museum of Ethnography, Stockholm. These were found in archaeological excavations carried out in western China in the beginning of the twentieth century. According to Rischel, the smooth raw fibres, the broad ramie fibres and the root-like residual fibres from linen and hemp that are present in the scrolls are characteristic features of Chinese paper up to ninth and tenth centuries.3 Thus, Rischel’s test results confirm the dating of AD 855. On the whole, it can be concluded that all of The Royal Library’s Dunhuang scrolls date from before the year 1000. In recent years, The Royal Library has been looking for opportunities to make the Dunhuang manuscripts accessible for international audiences in a digital form. This finally became possible when The Royal Library entered into a co-operation agreement with IDP. During autumn 2011, the scrolls were digitized and can now be accessed through IDP, either through searching on the home page for any of the manuscript numbers above, or from the catalogue page. 1. The company was founded in 1869 and is today known as GN Store. 2. Nord 2. A/S. Petersen, Jens O., ‘The Dunhuang manuscripts in the Royal Library of Copenhagen’ in Analecta Hafniensia: 25 Years of East Asian Studies in Copenhagen , ed. by Leif Littrup. Copenhagen-London: Curzon Press, 1988: 112-117. 3. Rischel, Anna-Grethe, ‘Skrevet på papir og skjult af sand. Papirhistorie fra Silkevejen’ in Nationalmuseets arbejdsmark . København: Nationalmuseet, 2001 s. 145. An article in English on the paper: Anna-Grethe Rischel: ‘Preliminary analysis of the Danish Collection of Dunhuang manuscripts’ in Manuscripta Orientalia, International Journal for Oriental Manuscript Research vol. 8, No 3 (2002): 53-58. 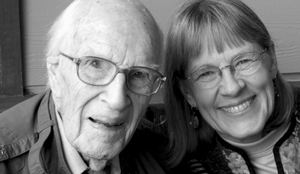 John B. Vincent on his 90th birthday with his daughter, Bronwyn. In 1948 John B. Vincent travelled to Dunhuang with his wife to study and photograph the Buddhist Caves at Mogao. He took the first set of colour photographs of the Buddhist paintings in these caves which were published by the University of Chicago Press and also by Faber and Faber in London in Buddhist Cave Paintings at Tun-Huang with text by Basil Gray. His wife, Irene’s book about Dunhuang, The Sacred Oasis, Caves of the Thousand Buddhas Tun Huang , had a preface by Pearl Buck. They returned to Peking in time to witness the People’s Liberation Army of Mao Zedong entering the city in 1949. Shortly before his death he donated the photographs and negatives of Dunhuang to the British Library and IDP is currently digitising them. He was thrilled to share his photographs, a fitting legacy. John B. Vincent was born on 1st September, 1915 in Kalamazoo, Michigan where he grew up. He attended Harvard University (class of 1937) and met his future wife, Irene Elizabeth Vongehr, in the summer of 1939 when they both attended the University of Michigan at Ann Arbor. They went out to Hankou, China where Irene had been born and where her parents still lived. From 1940–42, they worked as stringers for the Associated Press and also drove trucks of medical supplies for the International Rescue Committee in Free China. When the US entered WWII, John joined the US Army as a civilian employee working for the Office of War Information (OWI), China, India, Burma Theater, in the Kunming, China office where he interviewed Ho Chi Min and Zhou Enlai, among others. Following a brief period back in the USA they returned to China and made the subsequent visit to Dunhuang. They travelled in India before settling in Berkeley in 1951. Since 1968 they lived in Bainbridge Island, WA. John Vincent died on 18th January, 2012. 3 vols., Japanese and Chinese with English abstracts. Dissertation for a PhD at Harvard University, 2007. Hong Kong: ISAT/Costume Squad Ltd, 2000. 109 pp., col. ill., 29 cm. Catalogue of an exhibitition at China National Silk Museum, Hangzhou, 2000. 248 pp., colour and b&w ill., maps. 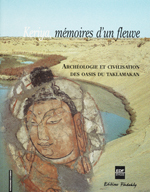 Catalogue of an exhibition held in Paris in 2001 curated by the archaeologists. Bangkok: Orchid Press, 2000. 166pp. Not for sale. Downloadable pdfs online. 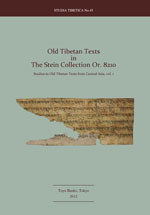 The third online volume on Stein in this series contains articles on Stein and his colleagues and on recent work on Stein collections. Moskva: Pamiatniki istoricheskoi mysli, 2010. 359 pp. The letters of the Russian Consul in Kashgar from 1870, N. F. Pterovskii (1837–1908). This exhibition displays over 200 artefacts, 124 from the Otani expeditions to Central Asia in the early 20th century. This exhibition examines why Chinese ceramics were such prized commodities, both at home and abroad. Featuring more than seventy pieces of porcelain, stoneware, and carved jade from the permanent collection of the Norton Museum of Art, this exhibition highlights the innovations and distinctive styles that arose as a result of this cross-cultural exchange. Who was Genghis Khan — a ruthless warrior, or a revered statesman? This exhibition addresses this question with the largest single collection of thirteenth-century Mongolian artefacts ever assembled, including gold jewelry, weaponry, silk robes, religious relics, and the newly discovered mummy of a Mongolian noble woman. Majestic 6th-century Chinese Buddhist sculpture is combined with 21st-century 3D-imaging technology in this exploration of one of the most important groups of Buddhist devotional sites in early medieval China. The exhibit includes fourteen objects from Xiangtangshan and three related Northern Qi works of art. Featuring over 350 treasures in jade, gold, silver, bronze and ceramics, discover the secrets of ancient China’s 2000 year old royal tombs. This exhibition is part of the London 2012 Festival and is the largest exhibition of ancient Chinese royal treasures ever to travel outside China. This exhibition, from the American Museum of Natural History, New York, features dioramas and interactives alongside original artefacts. Albert Grünwedel (1876-1935) led the first Turfan expedition in 1902 and was director of the Department of Indian Art at the Museum of European Ethnology in Berlin. The exhibition explores the 100-year history of the Buddhist wall paintings and highlights groundbreaking new strategies that have been developed to preserve the collection. Miss Xi Xiao, who left at the end of June 2011, has been replaced by a new image manipulator, Luo Weiyan (羅偉豔), who began work with IDP in early August 2011. From 20th-30th March 2012, Sofia Lin from Vancouver, Canada worked as a volunteer for IDP China. She helped to mark up one and check another bibliography. We are very grateful for her help. Because the south building of NLC is currently closed for renovation, the IDP digitisation studio moved to the old building of NLC in the inner city of Beijing near Beihai Park. The new studio is much smaller than the previous one. The studio will move back after the renovation is complete. IDP China marked up Huang Yongwu’s A Catalogue of the Chinese Dunhuang Manuscripts in the Beiping Collections《北平所藏敦煌漢文卷子目錄》and a bibliography, Shen Guomei’s A Bibliography of Dunhuang Manuscripts in NLC Collections《國家圖書館藏敦煌遺書研究論著目錄索引（1900-2001) 》. These two files will be uploaded to IDP shortly. During 2011, many people visited the IDP digitisation studio, including the staff of Crystal Computer Graphics, a global leading creative group of digital and visual services. The first stage of the visualization of Dunhuang Mogao Cave 220 is complete (at present digital images of the northern wall are exhibited, including preliminary production, ordering and image browsing). The Friends of Dunhuang, Hong Kong, Dunhuang Academy and ALiVE (Applied Laboratory for Interactive Visualization and Embodiement, City University of Hong Kong), are working together on this project. The three parties regard this as a first step in a larger project that they hope will attract further funds to enable more of the Dunhuang caves to be presented in this interactive format by ALiVE for scholarly and educational exploitation. Dunhuang Academy seeks to use new digitisation to display the Dunhuang caves in order to give the general public a more enriching educative visitor experience and to promote the unique cultural heritage of the caves. The main purpose of this project is as a pilot to establish a workflow for future development. City University, under Yu Zhiming, and the Dunhuang Academy will continue to work together to realise this vision. The Cave 220 Pure Land project has provided the Dunhuang Academy with a concrete case of creating a virtual reconstruction. It has also provided important opportunities for artists to analyse the images in detail and thus suggests a way forward for furthering research. ALiVE, with its scope and seamless 3D rendering, is an ideal partner for this work. A team from IDP UK visited IDP France in January to discuss future collaboration and this was followed up with a meeting in London in April. Now that most of the Pelliot manuscript material from Dunhuang in the BnF is available through the BnF online system, Gallica, it was proposed that IDP and BnF review material left to put online and prepare a plan to retrieve data from Gallica in the future. Discussions were held at the Musée Guimet concerning the possibility of including more photographic material from the Pelliot collection on IDP and also preparing a joint project to seek funding for digitisation and online delivery of more artefacts from the Museum’s Central Asian collections. Both these possibilities will be explored during 2012. On the 21st March, 2012 the Restoration Department of the State Library Berlin hosted a meeting with two projects financed by the German Research Foundation (DFG) to study the paper of selected fragments from the British Library and the Berlin Turfan Collection and the use of red and black pigmentation on fragments for which analysis is expected to provide information about their origin and possible interrelation. The glass frames of a number of Iranian and Old Turkish fragments of the Berlin Turfan Collection were opened to allow various physical measurements to be taken. Agnieszka Helman-Wázny and Renate Nöller, responsible for the two projects, presented their preliminary results to the Oriental and Restoration Departments of the State Libary, the members of the Berlin Turfan Study Group, the curator of the Museum of Asiatic Art and others in a meeting that raised expectations for a further meeting a year from now when the rest of the material will be presented. A team from the Museum für Asiatische Kunst (AKu) completed a field trip to Beijing and Xinjiang on 9th–30th September, 2011. Supported by the ‘KUR Project’ (Programme for the Conservation of Moveable Cultural Assets, funded by the German Federal Cultural Foundation and the Cultural Foundation of the German States) the main focus was conservation, and also the start of an official collaboration with the Xinjiang Kucha Research Academy. The participants were Dr. Lilla Russell-Smith (Curator, AKu) Toralf Gabsch (Conservator, AKu), Gerhard Prückner (Conservator, AKu KUR-Projekt), Dr. Caren Dreyer (Archive, AKu) and Satomi Hiyama (Research Fellow, AKu-Art Historical Institute, Florence). The team also visited the Bezeklik Caves near Turfan. Most caves were visited and a short survey prepared. In both places the possibility of further cooperation was discussed: joint publications and joint conservation projects are being planned. The journey was then concluded with a visit to the State Museum of Oriental Art in Moscow, where Dr. Tigran Mkrtychev, Museum Director introduced his museum collections, and past and future joint projects were discussed. Dr. Zhao Li, Deputy Director of the Kucha Research Academy received a one-year Chinese government grant for research at the Museum für Asiatische Kunst in Berlin. She also received a three-month Fellowship from the Stiftung Preussischer Kulturbesitz, Staatliche Museen zu Berlin. Dr. Zhao is working closely with Dr. Lilla Russell-Smith, Curator for Central Asian Art at the Museum, and they are planning a series of publications on the museum’s Turfan Collection, to be published jointly by the Xinjiang Kucha Research Academy and the Staatliche Museen zu Berlin. The first volume will concentrate on wall paintings and sculptures from the Kucha region, to be published in 2013. Dr Alexander V. Zorin was awarded the 2011 award of the Russian Academy of Sciences for young scholars in the field of literature and language for his monograph, At the Source of Tibetan Poetry. Buddhist Hymns in Tibetan Literature: 8th-14th Century [У истоков тибетской поэзии. Буддийские гимны в тибетской литературе VIII—XIV вв.]. St Petersburg, Peterburgskoe Vostokovedenie Publishers 2010. 384 p. (Orientalia). For further information see the Institute of Oriental Studies website. A small conference on Tanguts in Central Asia will be held on June 22-23 to celebrate the 80th birthday of Professor Kychanov. 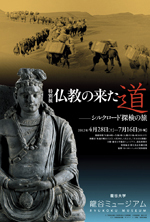 Ryukoku Museum is currently showing an exhibition of Buddhism on the Silk Road (see Exhibitions for details). IDP Korea held an academic symposium ‘Retrospect and Prospect of the Research of Civilizational Exchanges in Korea’ co-hosted with the Korean Society of Dunhuang Studies and The Korea Institute of Civilizational Exchanges on 17th December, 2011 at the Research Institute of Korean Studies (RIKS) Auditorium, Korea University. With nine works represented, Korean scholars gathered to present, discuss and debate. IDP Korea published issue 3 of its newsletter. Copies are available from the address below. Last December, the German Ambassador to South Korea, H.E. Hans Ulrich Seidt visited IDP Korea. He is well-known for his affection of Korean culture and for his research on Central Asian studies. He is also an advisory board member of Bibliotheca Afghanica . He met Dr. Yongchul Choe, Director of RIKS, after attending the opening of the ‘Dunhuang Impression’, a painting exhibition held in the RIKS Gallery. Then he visited IDP Korea to give an interview. He left a great impression on all of the RIKS members with his passion and kindness. We are grateful for his visit. Below is an edited transcript of his interview. Yoon-hee Hong: Thank you very much for accepting our request for interview. H.E. Hans Ulrich Seidt: I am very glad to have an opportunity to visit your institute. YHH: I heard you served as German Ambassador in Kabul, Afghanistan before you came to Korea. And you are a member of the Advisory Board of Bibliotheca Afghanica. I’d like to hear why and how you became interested in Central Asian Studies. HUS: My first experience with Central Asia goes back more than 20 years, during the last years of the Soviet Union, I was posted to Moscow. And at that time I already had the opportunity to travel in Central Asia. Later on, I was posted for several months as the head of the German embassy to Tajikistan in Dushanbe where there are very interesting links to East Asia, for example Sleeping Buddha, in Dushanbe museum. And later on, I went to Kabul. YHH: Please tell us about the relationship between Germany and Central Asia. HUS: In Germany, we have a specific interest in Central Asia and Eurasian affairs. It goes back to Alexander von Humboldt. In 1829, he travelled to Central Asia and published a book. Later on, a German geographer in Berlin, Carl Ritter. studied the literature and manuscripts and published many articles on Central Asia. Then there was the famous geographer, Ferdinand von Richthofen. He travelled extensively, in China, in particular in Dunhuang area, and he was the man who coined the phrase ‘Silk Road’. Then there was Albert von LeCoq: as you know he was active in Turfan. Since then, Germany has retained an interest in Central Asia. Immediately after reunification, we established a Eurasian department in our German Archaeological Institute.This is a major research institute in Berlin, funded under the auspices of German Foreign Office. I believe that this is the reason also why I am here; and in this field, we can still make major discoveries for better understanding inter-relationships between Asia and Europe. YHH: Could you give us more concrete examples about major discoveries? HUS: In 1953, a Buddha statue was discovered on a Swedish island, in a place called Hengo. If you establish your relationship with the Swedish IDP, you should go to Sweden and ask them about the Buddha from Hengo. We have also discovered one to two hundred Arabic coins coming from the Silk Road along the river routes to the north. About the same time, Korean monks were traveling to India. People believe that the Buddha from Hengo also comes from India. I strongly believe that if we focus on this research, we will be able to make major discoveries. YHH: So is your interest mainly focused on archaeological discoveries? HUS: I see it in context. I think this is so important to the IDP project and also the Turfan project in Germany. First, it is international, it’s a global enterprise. Secondly, it is interdisciplinary. This is a project where we go beyond the traditional fields of research and combine archaeology, art history, history of literature, mythology, and from different countries to different works of academic life. And this makes IDP so important. YHH: Would you tell us more about the Bibliotheca Afghanica Swiss Afghan institute? HUS: Bibliotheca Afghanica Swiss Afghan institute was founded in 1975. At that time, Afghanistan was a peaceful developing country, and many German-speaking Swiss and Austrian researchers were working there. Two research institutes were established. One was in Germany at the University of Bochum, focusing mainly on development studies. Whereas the Swiss Afghan Institute focuses on history, archaeology and cultural history, we collect archival material— if a German scholar dies, we try to obtain his archive. Bibliotheca Afghanica is the name of the library. Since I became member of the board, a new area of interest called Phototheca Afghanica has started collecting nineteenth-century photographs and putting them online with metadata. The material is accessible for students and researchers, and is mostly used by PhD candidates who are writing their dissertations on the material. We also have some rooms where they can sleep and study. I was delighted that I was elected as a board member of the council. Normally there are five Swiss members and two German members. YHH: Would you tell us more about your book Berlin-Kabul-Moscow: Oskar von Niedermayer and Germany’s Geopolicy ? HUS: he book is not so much related to history, but deals with one aspect of German research in the first part of twentieth century, when geography was used as an instrument of imperialism. So it is controversial, and I believe that this was a very interesting history, but should not be followed now — namely using research and science for imperialist purposes. YHH: Who was Oskar von Niedermayer? HUS: He was a geographer and researcher, and an early traveller to Afghanistan. He published a major book in 1924, Afghanistan , with a lot of photographs, very important material on Afghan history, ethnography and so on. He was also a professor at a research institute in Berlin. But already at that time, Germany was also looking farther east, mostly China and Japan. Nowadays we better understand that already at that time Silla was a major part in this whole network. YHH: Based on your experiences in Central Asia, what do you think we could add or improve which could be beneficial to our future generations studying the subject? HUS: I think it’s very important to study very carefully the many centuries of the interrelationships along the Silk Road. There are so many things we have in common. For example, the monastic system in Korea and the monastic system in the west are similar. The lifestyle of a Christian and Buddhist monk or a nun was not so different. And also we have to look into the mythology. There is still a lot to be done, because until the arrival of Christianity in Western Europe, people were very much focused on mythology. There is so much to study and we can only do it if we cooperate on an international scale. YHH: The last question is a little personal, but can I ask your wishes for the upcoming New Year? HUS: I sincerely hope that we will continue with scientific corporation with Korea. Of course I hope that also RIKS in its cooperation with European partners can also become more active in cooperation with our institutes in Berlin, such as the Turfan project in Berlin, and also the work done at several universities. 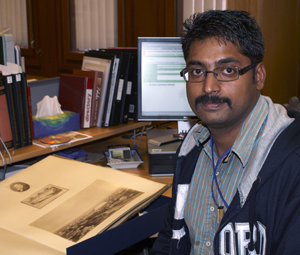 We were delighted to welcome Deepak Bharathan, a researcher from the Alkazi Foundation India, to IDP UK in early 2012. This continues the programme of internships under the World Collections Programme. Hu Wanglin from the Xinjiang Insitute of Archaeology in Urumqi finished his internship and returned to China in March. Susan Whitfield attended a workshop organised by the Dunhuang Academy and supported by the Mellon Foundation to review and advise on the report on the building of a digital asset management system and online digital resources for the digital images of the Dunhuang caves. While there she visited the new Visitor Centre (right), currently under construction. IDP UK and Germany have supplied over 17,000 image links of Tocharian manuscripts for use on The Comprehensive Edition of Tocharian Manuscripts website hosted by the Department of Linguistics at the University of Vienna. Details of over 800 manuscripts are now online with images pulled directly from the IDP UK database. Agnieszka Helman-Wazny, who is conducting ongoing paper and fibre analysis of the Dunhuang scrolls (see earlier reports) and Renate Nöller from the Federal Institute of Materials Research and Testing in Berlin visited. Susan Whitfield, Alastair Morrison and Agnieszka visited Kew Gardens Herbarium to meet Dr Mark Nesbitt and discuss potential collaboration on paper analysis. Kazushi Iwao (Kobe University) spent a week at IDP UK to finish work with Sam van Schaik on a catalogue of the Tibetan manuscripts in the Or.8210 sequence. The catalogue has now been published and is available online. 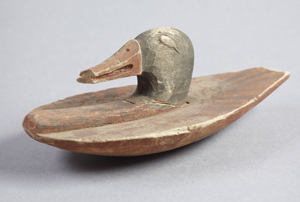 Model duck from an Astana tomb. Susan Whitfield spoke about IDP-CREA at the launch event of the ‘EU-China Year of Intercultural Dialogue’ in Brussels and Vic Swift presented on IDP at a workshop of European Science Foundation in April. In March, Imre Galambos lectured on ‘Modern Cultural Trends in China in the Light of Manuscript Studies’, at the Confucius Institute in Budapest. Susan Whitfield spoke on IDP at the Courtauld Institute workshop, ‘Buddhist Art Forum’. IDP made a successful bid to the Arts and Humanities Research Council for a 14–month project entitled ‘Contextualising Texts: Enhancing the Research Potential of Buddhist Manuscript Material’ and work started in February 2012. The project aims to work closely with academics and their students to develop, test and implement an enhanced multimedia research interface giving free access to richly interlinked and reusable resources suitable for interdisciplinary research by historians, art historians, geographers and archaeologists. To date, IDP UK has held two workshops with UK academics to ask for their feedback on the uses of IDP resources in their teaching. We will be asking users to complete an online questionnaire later this year and will use the feedback to help direct our redevelopment work and future plans for digitisation. IDP Studio Manager and Photographer, Rachel Roberts, working together with the British Museum Research Assistant, Catrin Kost, finished photography of the British Museum Stein and other Central Asian collections of artefacts. The metadata is now being updated by Catrin and checked and imported into IDP. THANK YOU to all those who so generously responded to our end of year appeal. Your contributions are greatly valued and are enabling us to concentrate on our core work. Our next major goal is to redesign the IDP database and website to enable much greater search and display functionality and speed. You can make a contribution through our online form or by sending a cheque to IDP at the address below (payable to ‘The British Library’). All donations will go directly to the work of IDP and will be acknowledged online. You can also choose to sponsor a sutra and add your own message online.